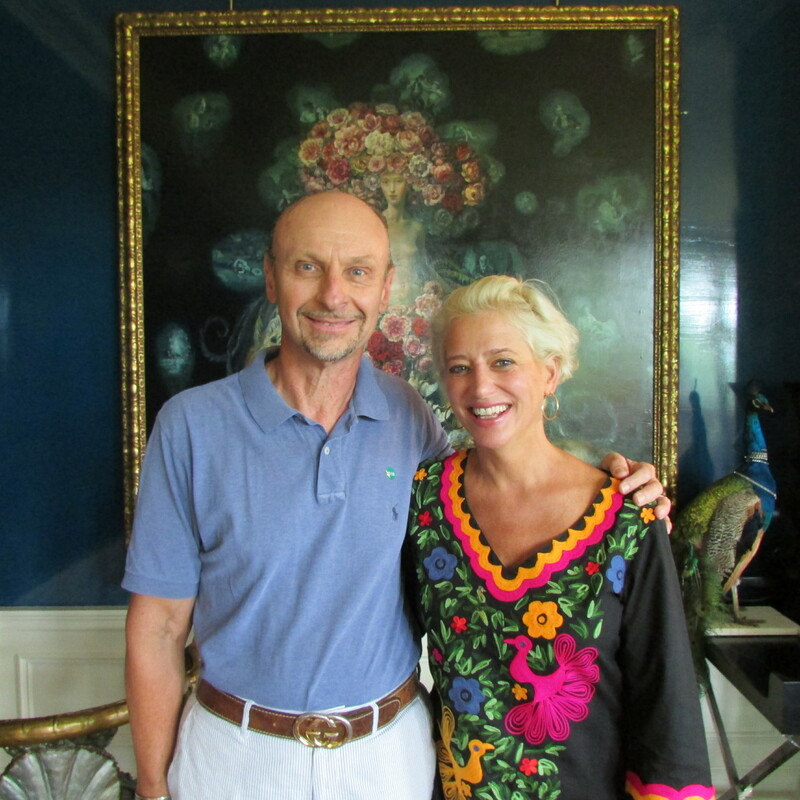 Dorinda Medley and me in her Living Room at Blue Stone Manor, on the day of the Lenox Garden Club Tour. 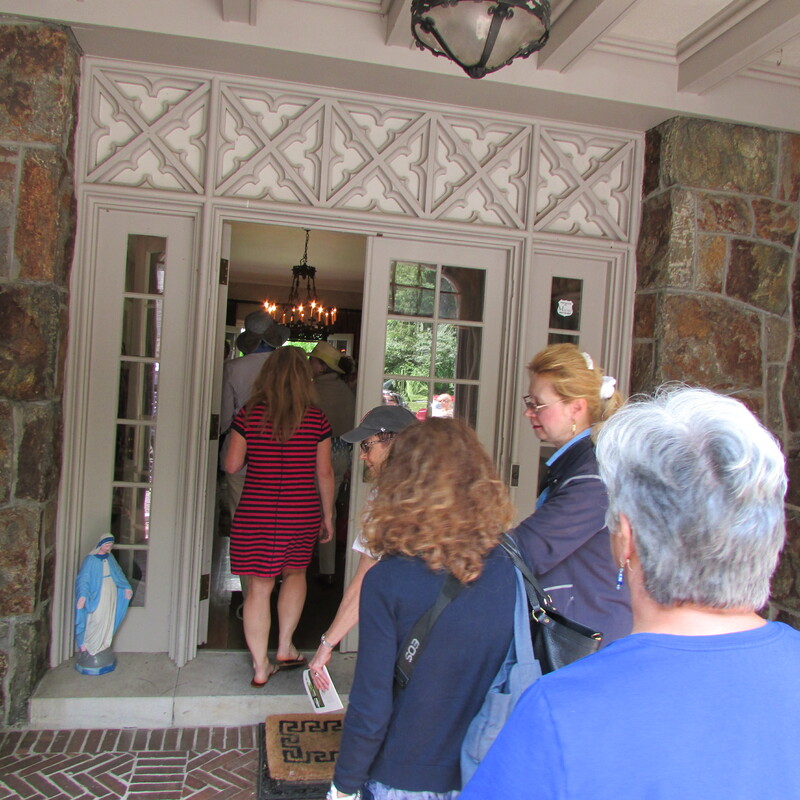 Garden tour patrons approaching the front door of the mansion. 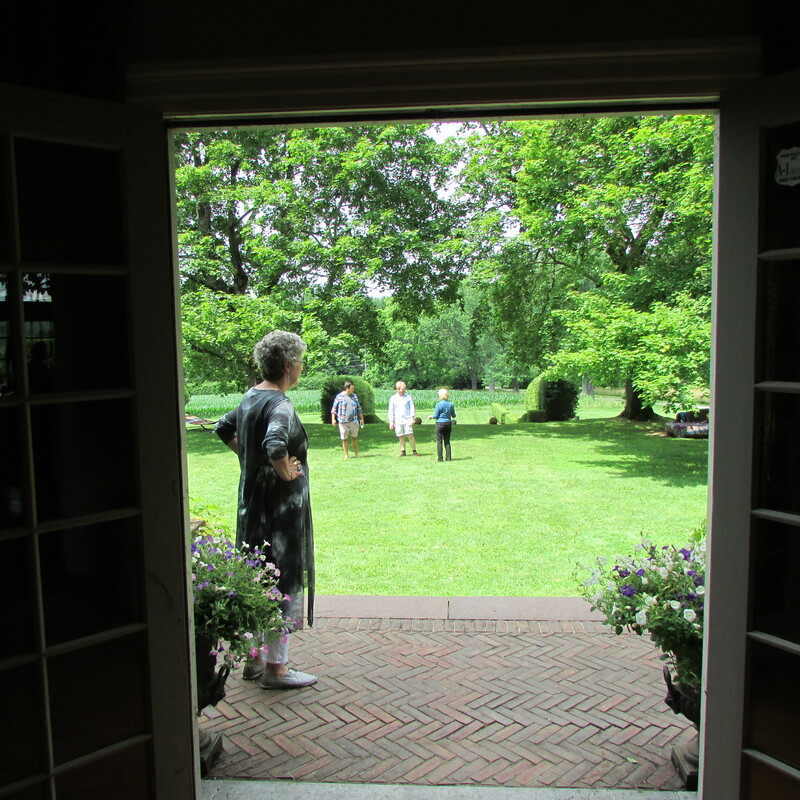 On July 15, 2017 The Lenox Garden Club held its biennial garden tour, and one of the show-stopping properties visited was Blue Stone Manor. Blue Stone Manor is the country home of Dorinda Medley who is a reality TV star on Bravo’s The Real Housewives of New York City. 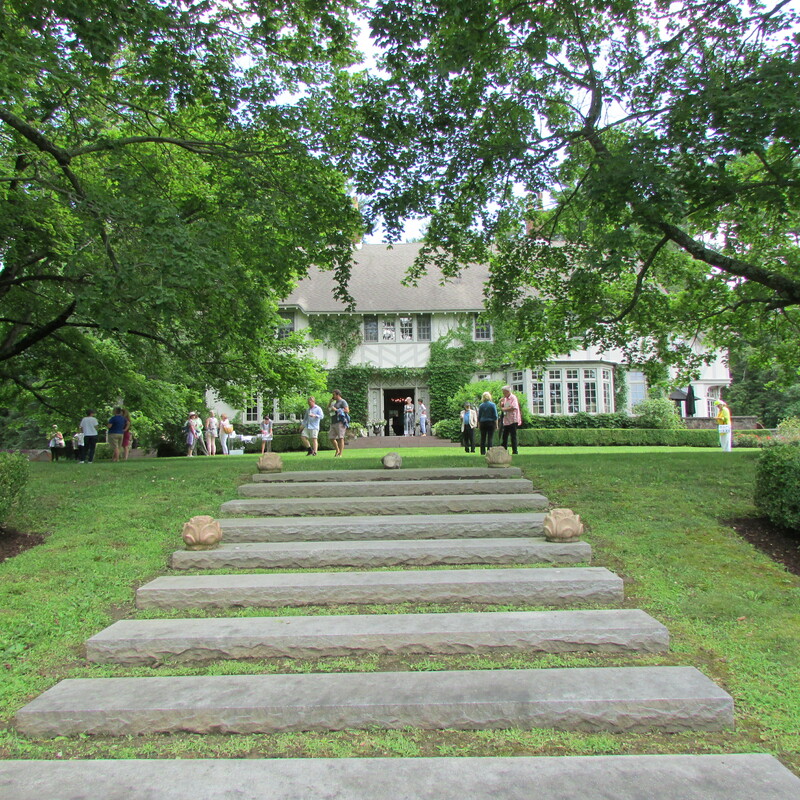 Dorinda and four other property owners were kind enough, to open their gorgeous homes and spectacular grounds, for the day, as a fundraiser for The Lenox Garden Club. People from far and wide traveled to Great Barrington, Massachusetts for the “sold out” tour. This blog post shows some of the well-appointed rooms and grounds at Blue Stone Manor, decorated by the super tasteful, effervescent and charming Dorinda Medley. 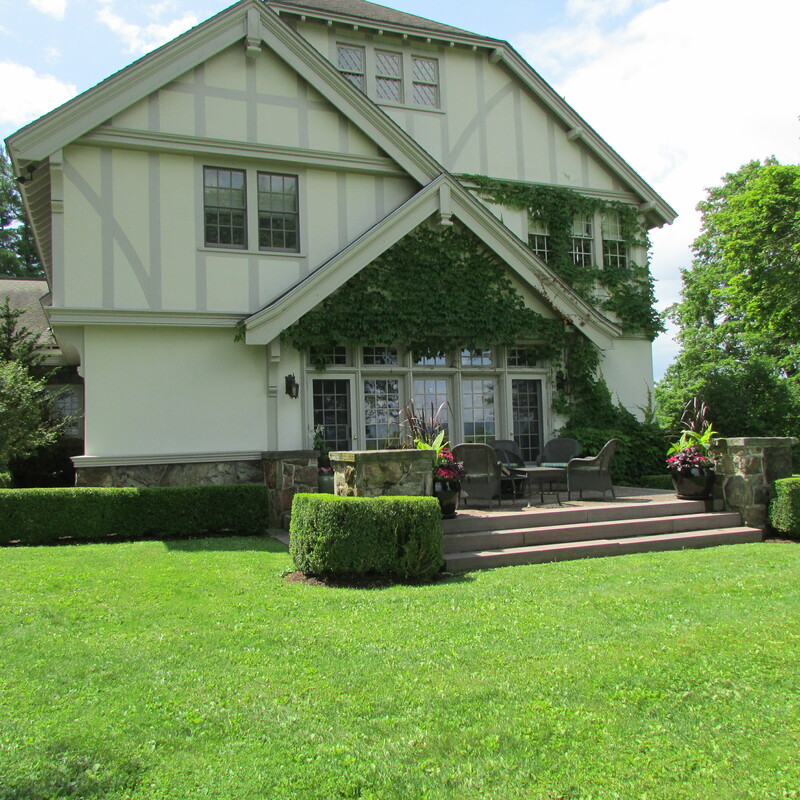 Blue stone Manor is a classic “Berkshire Cottage” done in the Tudor style and was built in 1902. 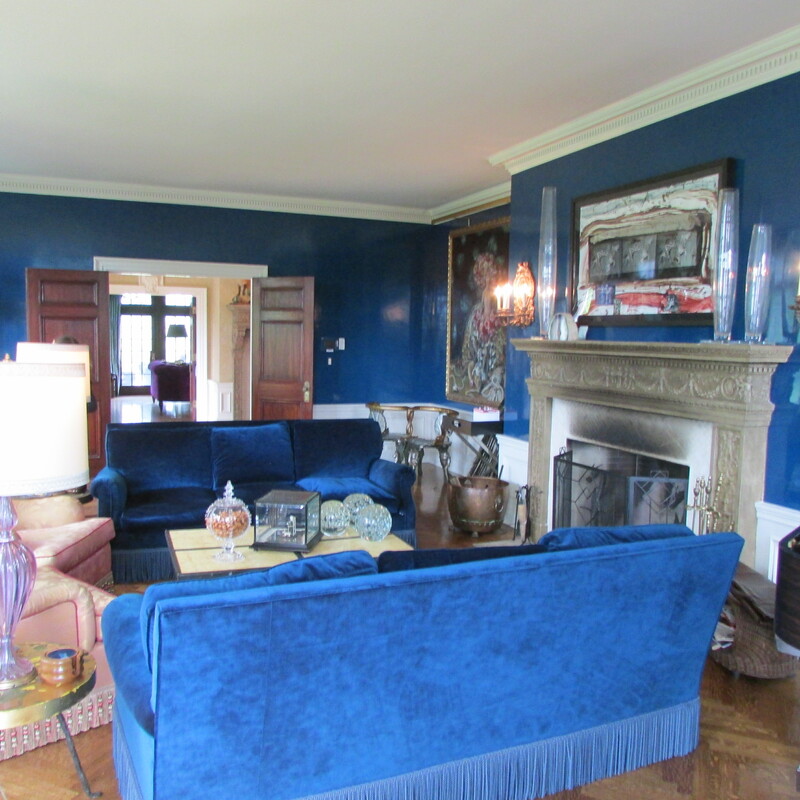 The house takes its name from the beautiful stone walls with massive blue stone caps constructed by Dorinda’s grandfather. Blue Stone Manor is a house with well per-portioned rooms, that are large, but still have a cozy feel. The cottage has a warm and inviting vibe, and after walking through the rooms that I viewed, I noticed that it has good traffic patterns that would promote easy circulation during parties. The above two cover photo show our hostess Dorinda and me, along with a view of the front motor court side of her house. (click on photos to enlarge). 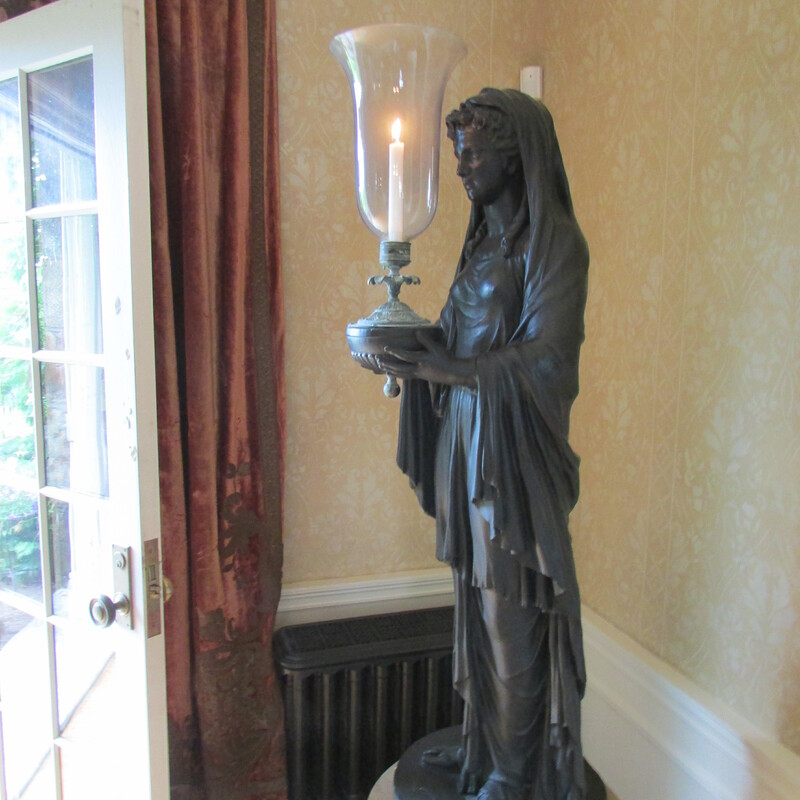 As guests wait to enter the cottage, they notice a statue of the Virgin Mary who guards the entry and gives a blessing to all who enter the house. 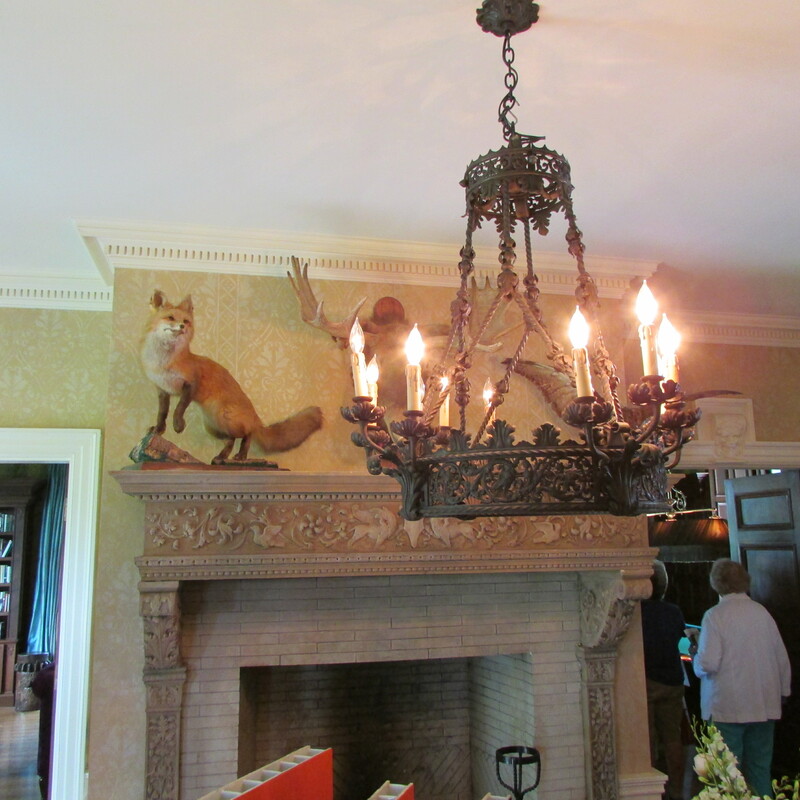 Once inside the great hall, which runs from the front of the house to the back, guests are greeted by a trio of taxidermy animals that look down from their lofty perch atop the fireplace mantel. 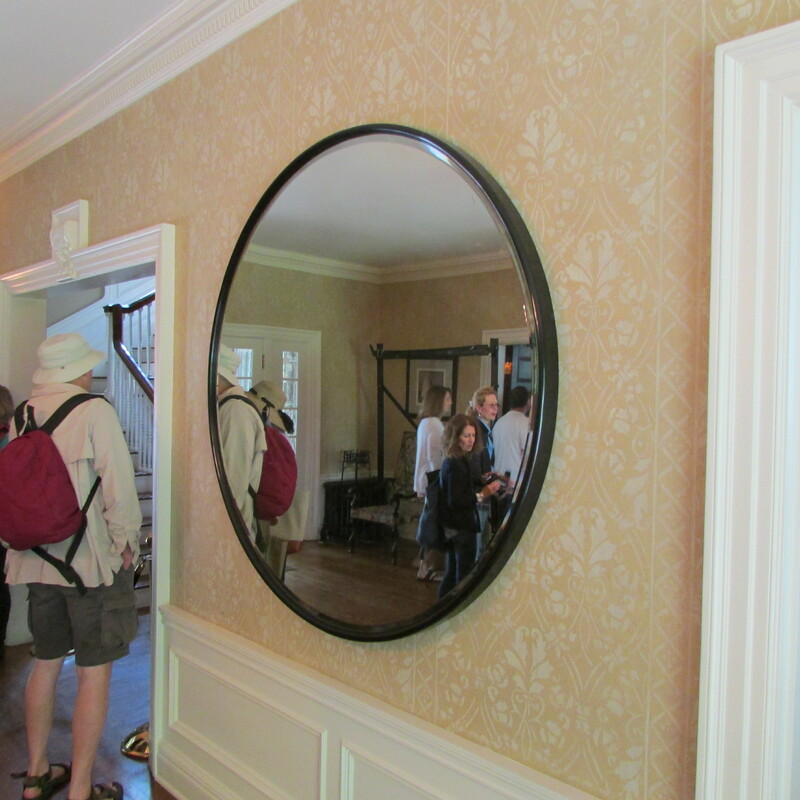 A large round mirror visually opens up the wide front hall even more, bouncing light around and reflecting things on the other side of the room. 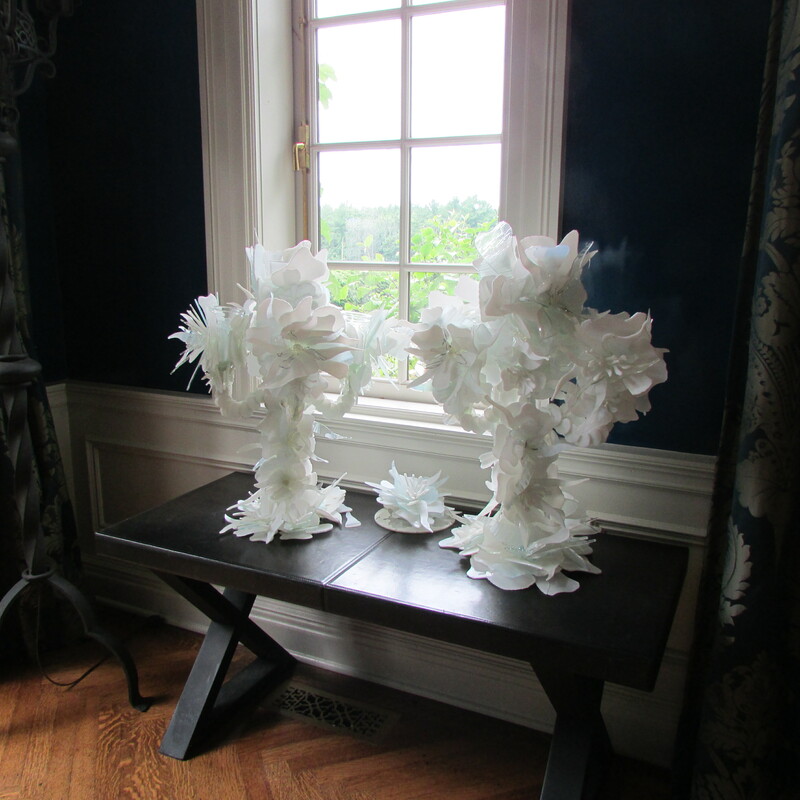 At the back of the great front hall, a pair of “classical maidens” holding glass hurricane shades flank the french doors leading out to the great back lawn. Looking at the above photos notice how Dorinda repeated the dark bronze color from the chandelier in the hall, to the andirons in the fireplace, to the frame of the large circular mirror and then on the finish color of the bronze ladies. (interior decorating is all about repeating and working the same colors, around a space, to tie everything together). Finally, in this space, notice how the color of the wood table, in the center of the room, is also similar to the color of the doors (for darkness) leading into the next room. 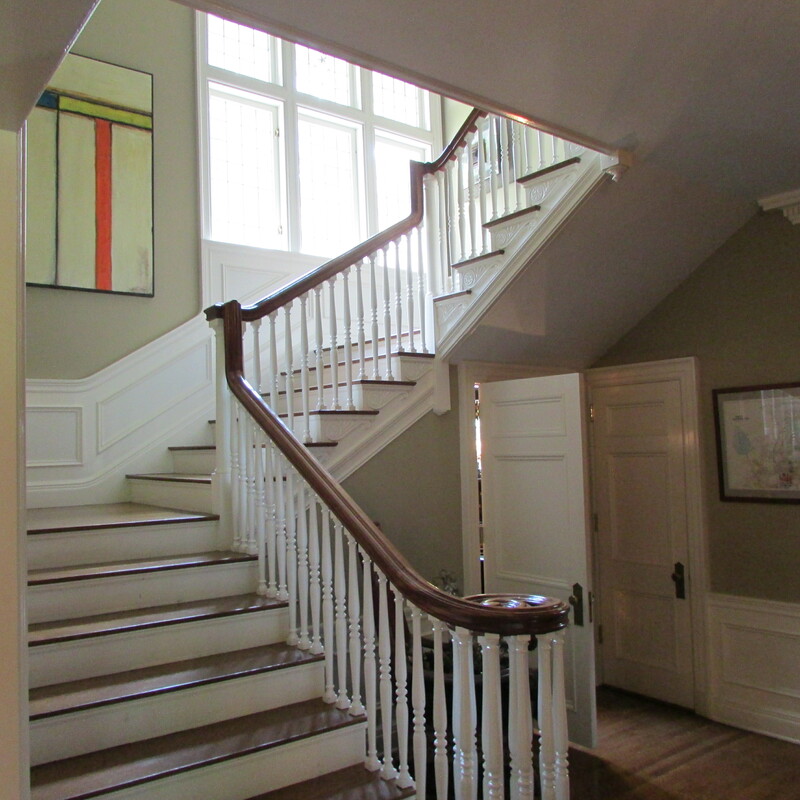 Once inside the front door, looking left from the great front hall, is the stair hall, which looks to lead to the dining room. The above three photos show, what I think??? is the library, because of the built-in book cases. 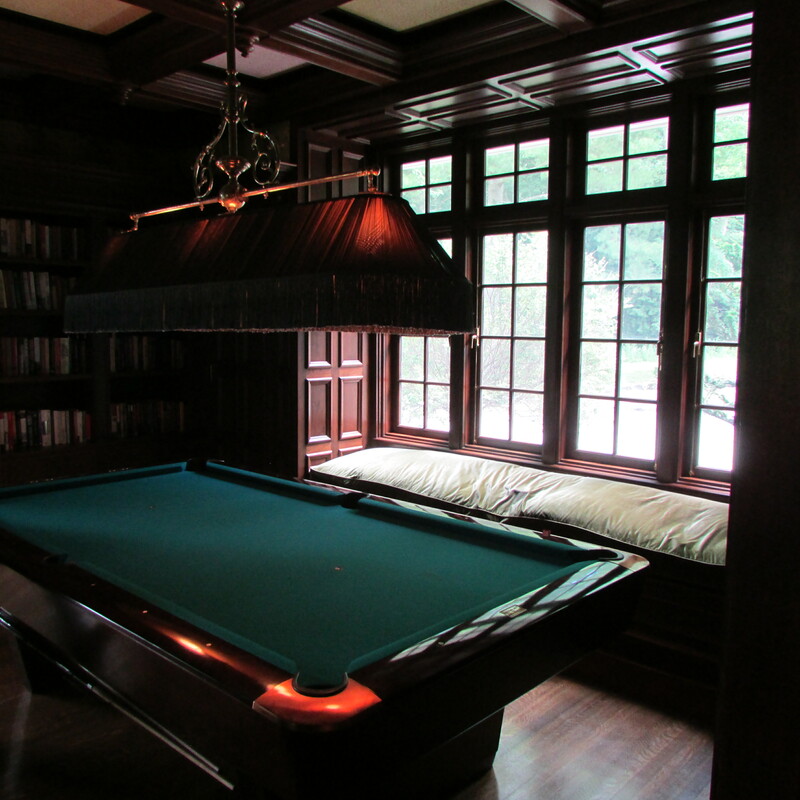 The first thing you come upon, when entering the room, coming from the front hall, by the front door, is the pool billiards table (what it’s probably called in a Berkshire Cottage). The above photos show the room looking from both the front and back. Interior decorating is all about balancing weights, and in this room with a lot of heavy woodwork, the bright/rich purple sofas perfectly counterbalance all of the wood, and adds a warm and fun pop of color to the space. The visual weight of the purple sofas also balance the dark visual weight of the cover of the billiards table. The sofas floating in the center of the room, flanking the fireplace, help break up the room into three zones (the billiards area, seating around the fireplace for conversation, and seating at the back of the room). 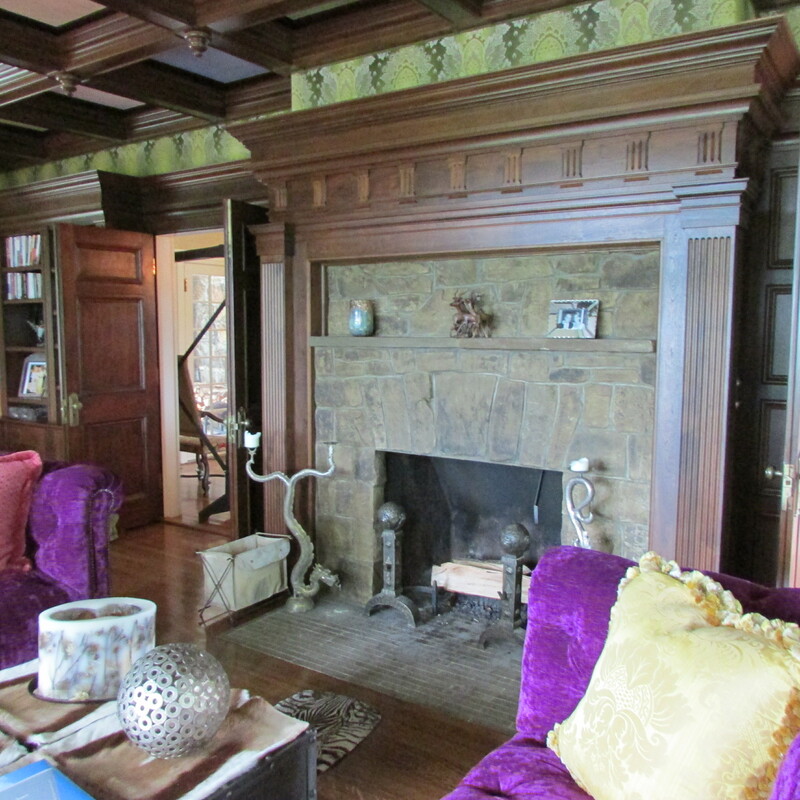 The above photo shows the fireplace being flanked by the two purple sofas. Notice how the silver color of the pierced sphere, on the boxes that make up the coffee table, is repeated as the color of the dragon candlesticks and andirons by the fireplace. 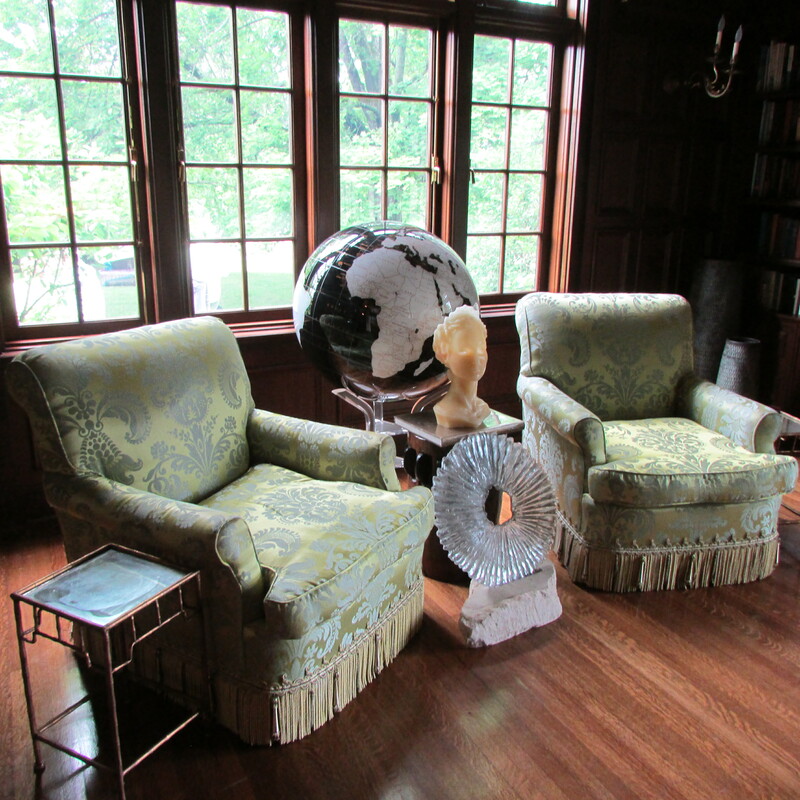 This furniture arrangement composed of two club chairs, a large globe, side table with bust, end-table and modern sculpture are an important counterbalancing grouping in the room. The above items, counterbalance for approximate size and visual weight, the billiards table seen on the other side of the room. Looking at this room, other than the dark brown color of the wood, the colors used in the space are the bright purple of the sofas, the celery greens seen on the pair of club chairs (and possibly repeated on the big window seat cushion by the billiards table). The green tone is also seen on the wallpaper that runs around the top of the room. 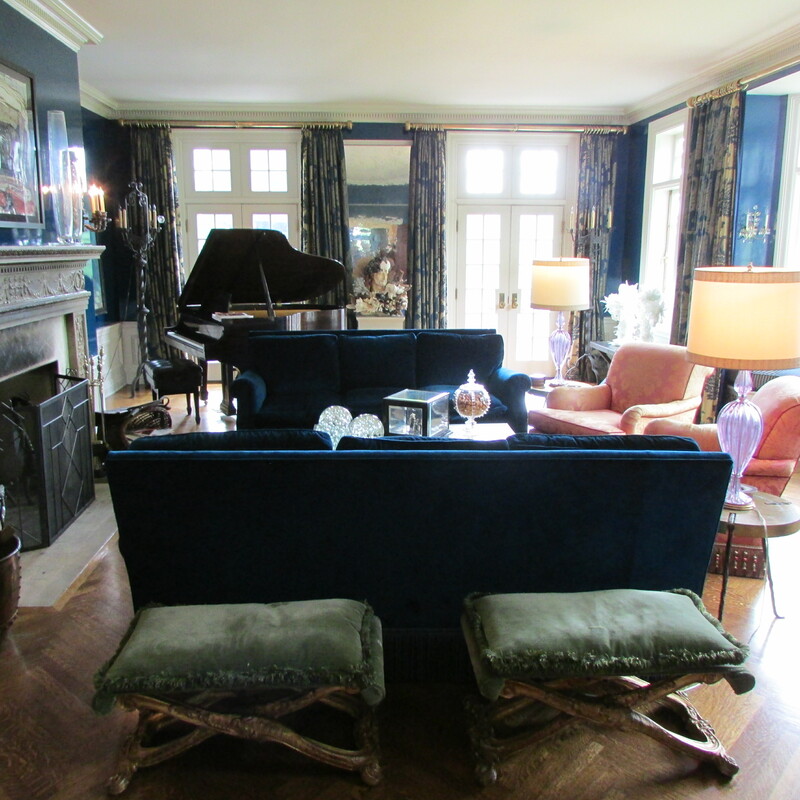 The color blue is seen on the drapes and the sofa in the window opposite the fireplace and looks to repeat as the cover color of the billiards table. A pinkish-red color appears on the light fixture over the billiards table and is also seen on a couple of pillows on one of the sofas. If you look carefully at the ceiling in the photos, you will also notice that the light green and pinkish-red is the color of the paint in the different boxes that make up the coffered ceiling. A golden yellow is also seen on some sofa pillows. (As stated before, interior decorating is all about moving/ repeating the same colors and even patterns in different places in the same room, which keeps the eye moving from one place to the next). 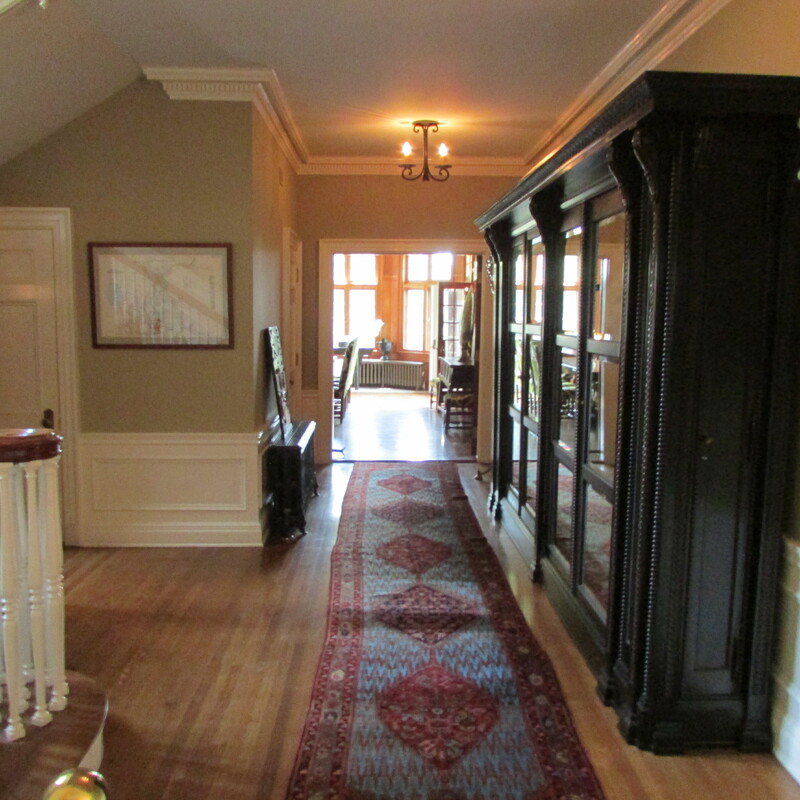 Finally, the dark brown of the woodwork is also repeated on the floor as the color story of the zebra looking rug. 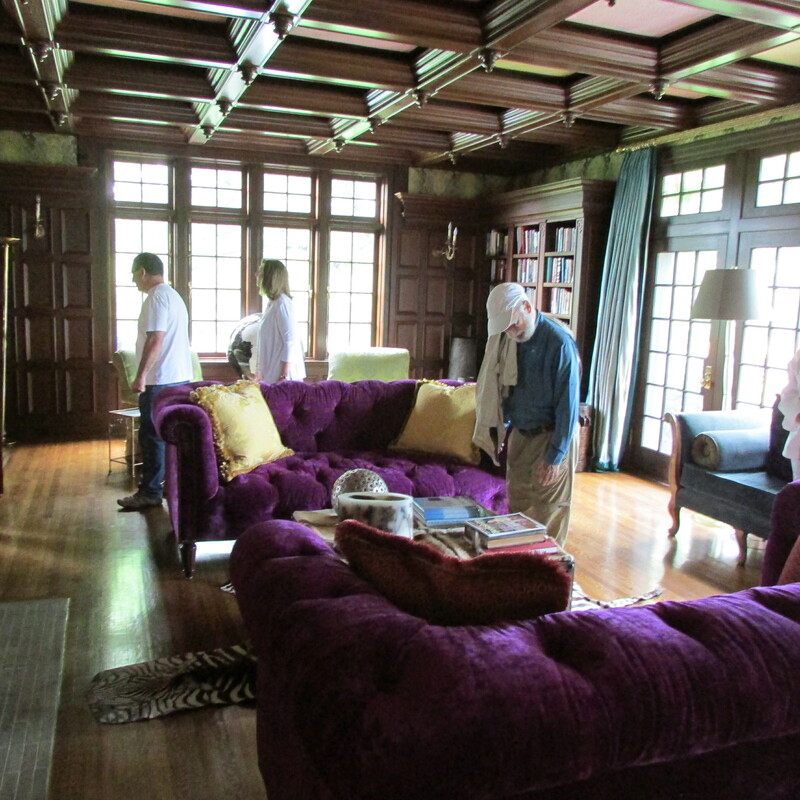 Exiting the library, and crossing the great front hall, we are now in Dorinda’s salon (a salon in a Berkshire Cottage is a living room anywhere else). Highly glazed, possibly Venetian plaster walls, beautifully reflect light coming in from every window. The magnificent room looks like you are in a lacquered box. 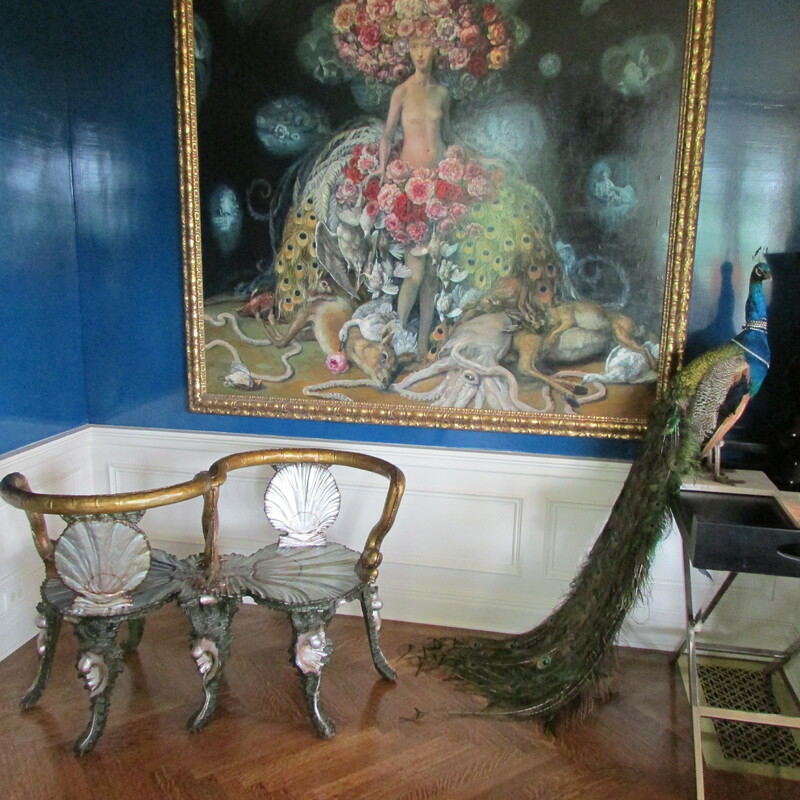 Some of the decorating high-lights in the room include the large painting, which could have been the inspiration piece from which all the color choices (blue, pink, green and gold) used in the room could have been culled, the Venetian grotto tete-a-tete bench and the stuffed peacock. (notice how the feathers of the peacock also appear in the painting). 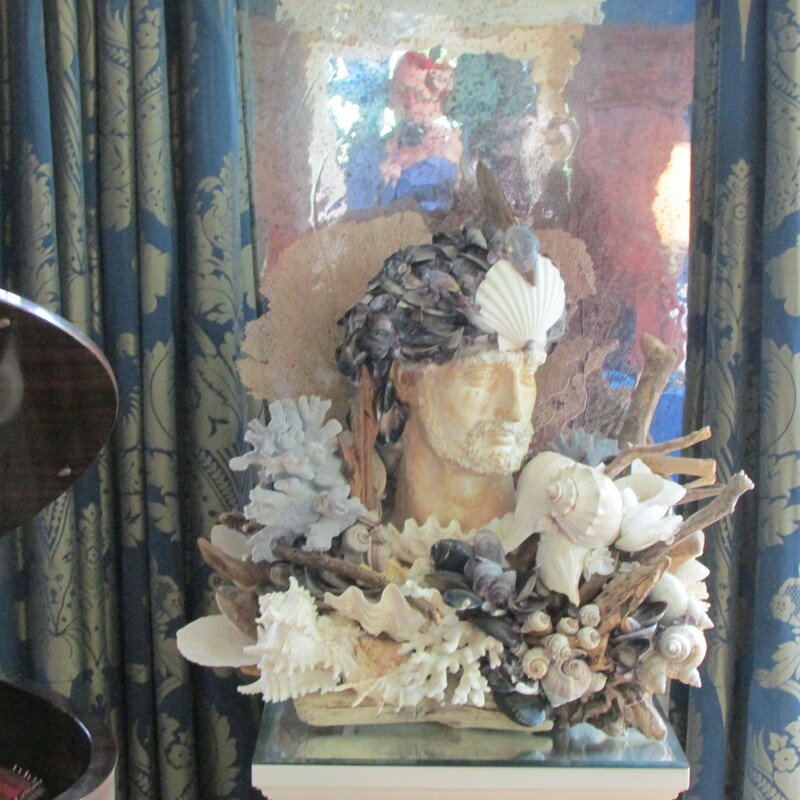 A bust of Poseidon (Neptune) the god of the seas and oceans, adorned in assorted shells and coral observed visitors from his pedestal on the far side of the room. 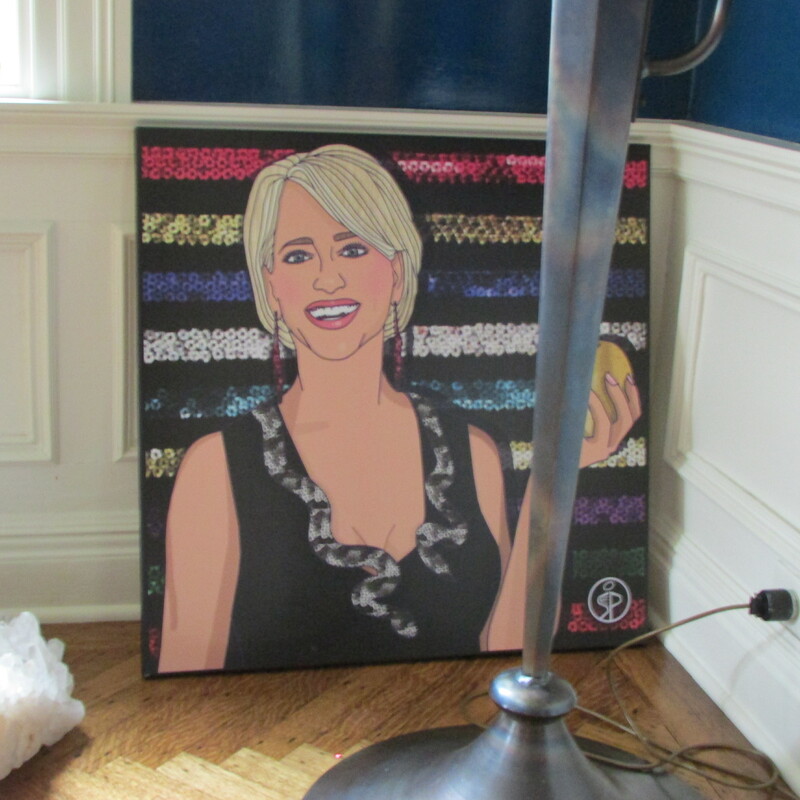 And a fun modern painting of Dorinda, queen of the castle, wearing a snake as a necklace was tucked into the corner of the room, down by the floor. 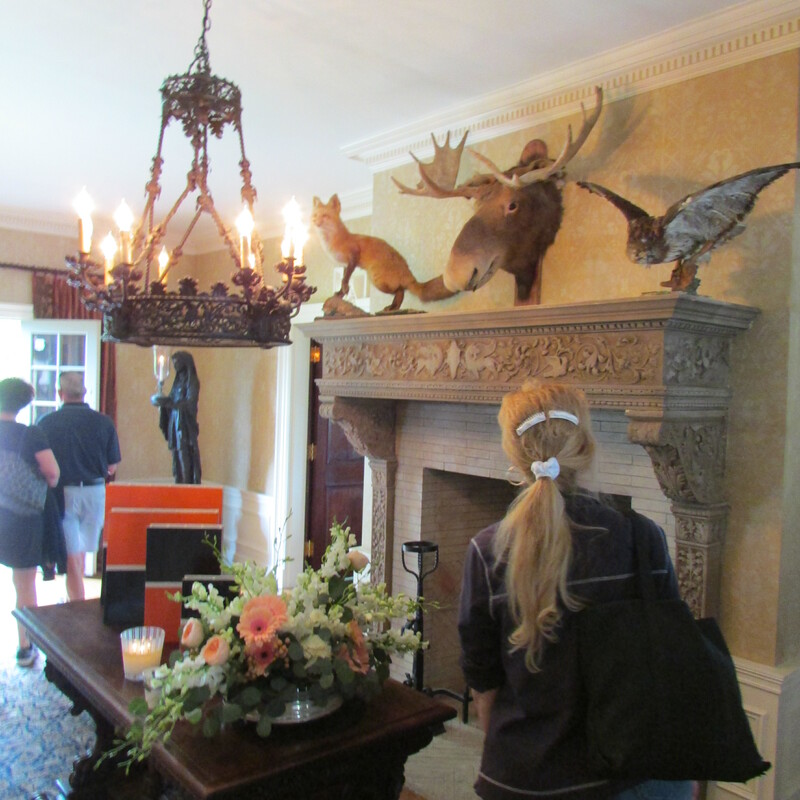 (After viewing the salon, we proceeded outside to tour the grounds). The above photos show the back of the house. The open french doors are at the back of the great front hall, and line up with the stone steps that bring you down to the parterre rose garden. 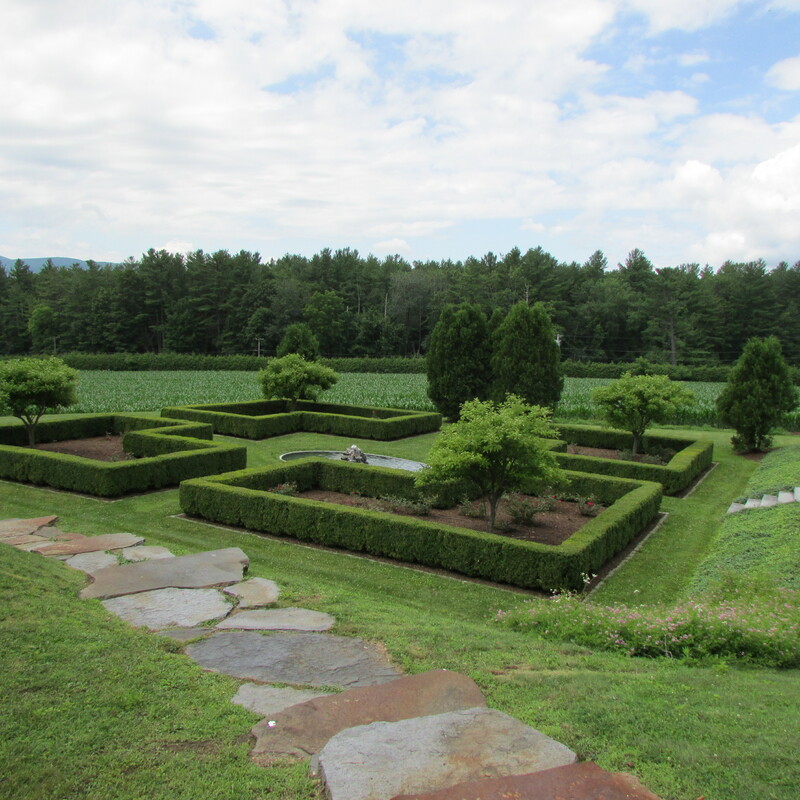 To the left of the stone steps, leading down to the parterre rose garden, is the pool area. Two pool fountains help heighten the visual experience. The metal urns positioned at the four corners of the pool look to be gas fire pots used for nightly illumination and ambiance. 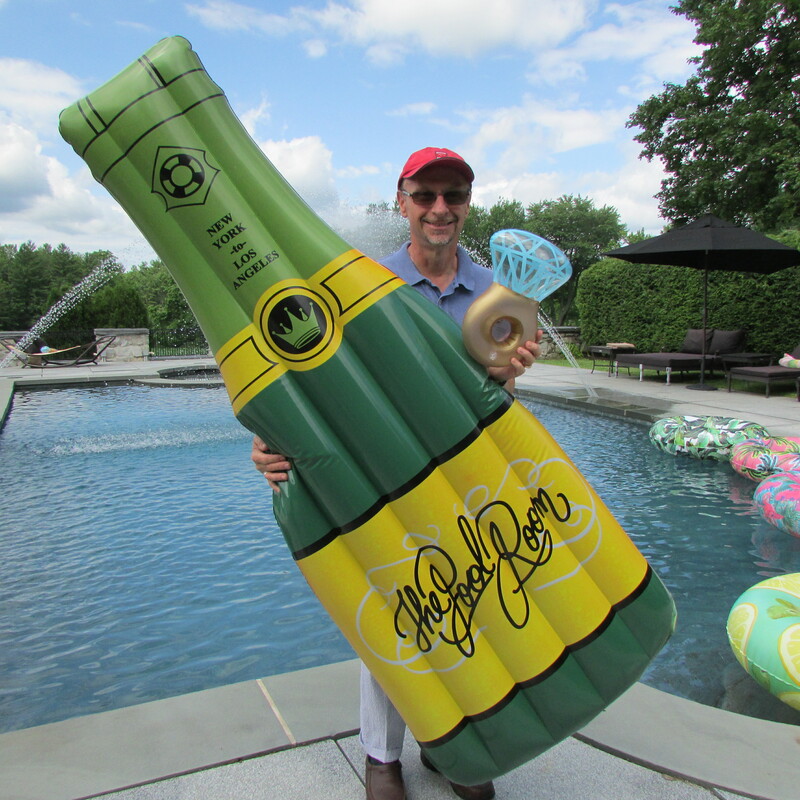 While by the pool I found a large bottle of champagne and an enormous diamond ring. Dorinda is really the hostess with the mostess! Around the pool, and by the house Dorinda has different patio areas where she can entertain guests. 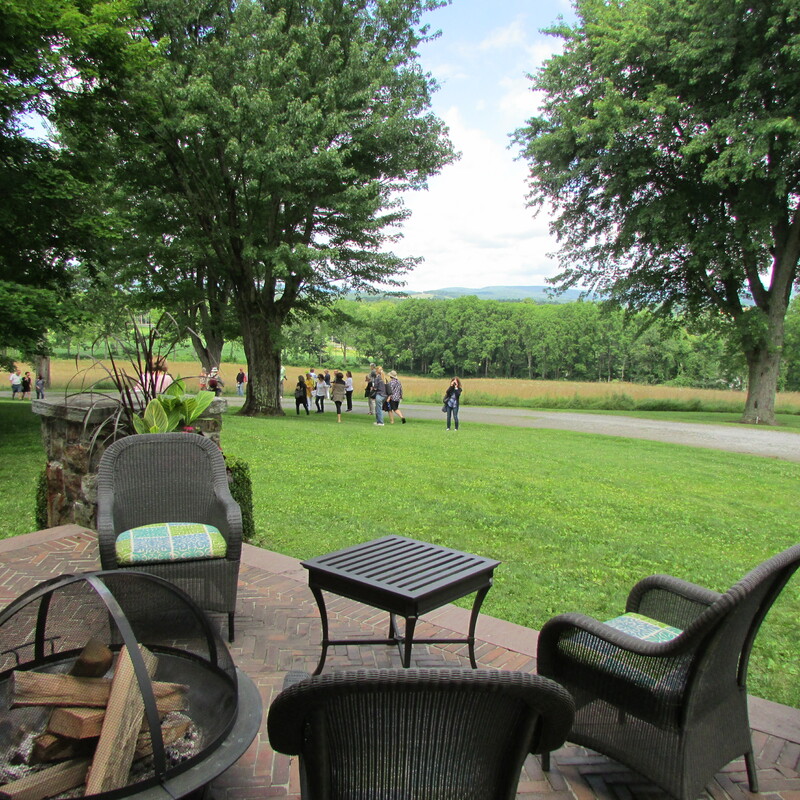 My last photo for this blog post and tour of Dorinda Medley’s Blue Stone Manor is from one of the patios, looking down from the house to the entry road, with views of the lawn, field and mountains in the distance. Garden tour guests are seen walking back to the buses to go on to the next estates. 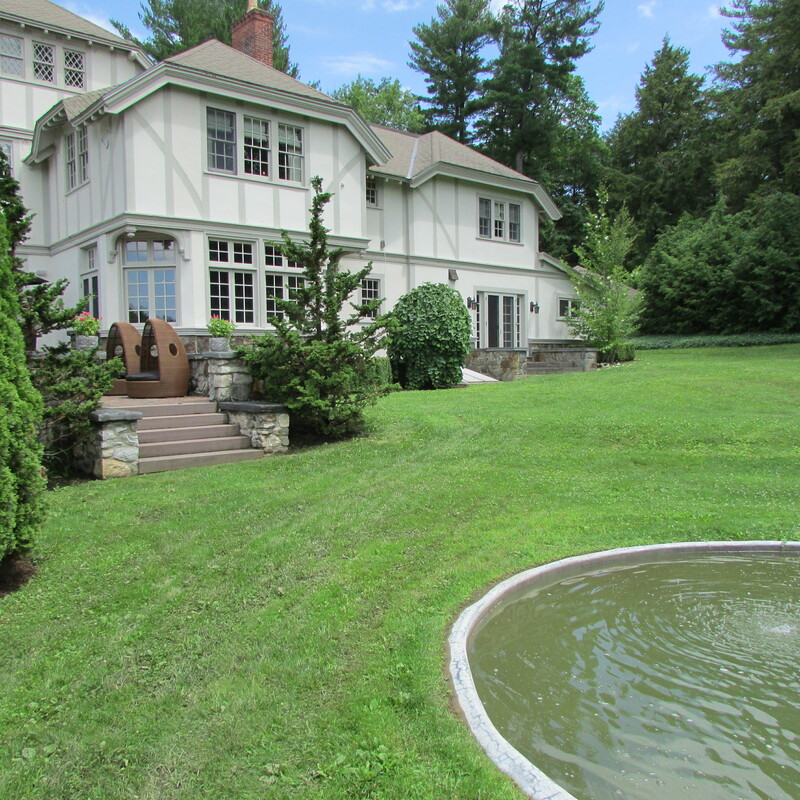 After visiting Blue Stone Manor and meeting Dorinda Medley it will be even more interesting watching The Real Housewives of New York City, especially when they are seen in the Berkshires. It will be fun to know and tell others that I’ve been in some of those rooms and on that beautiful piece of Berkshire property. The Lenox Garden Club is a member of the Garden Club of America and was founded in 1911. The club is dedicated to enhancing the community through beautification, historic preservation, conservation, education and the fine arts of gardening and floral design. The Garden Tour is the main source of revenue for the club’s projects. In the last several years, the Lenox Garden Club has given away in excess of $400,000 to worthy causes in the Berkshires. A link to the Lenox Garden Club’s website and Dorinda Medley’s instagram will be in the first comment following this post. The answer to..”Can you put a Floor Lamp next to a Sofa?” 10-4-2012. Thank you for the delightfully inspiring tour Fred! Love the initial photo of you and Dorinda. I don’t have access to American TV, so this was an added bonus to see what is meant by ‘real housewives’ today in the US, hahaha. 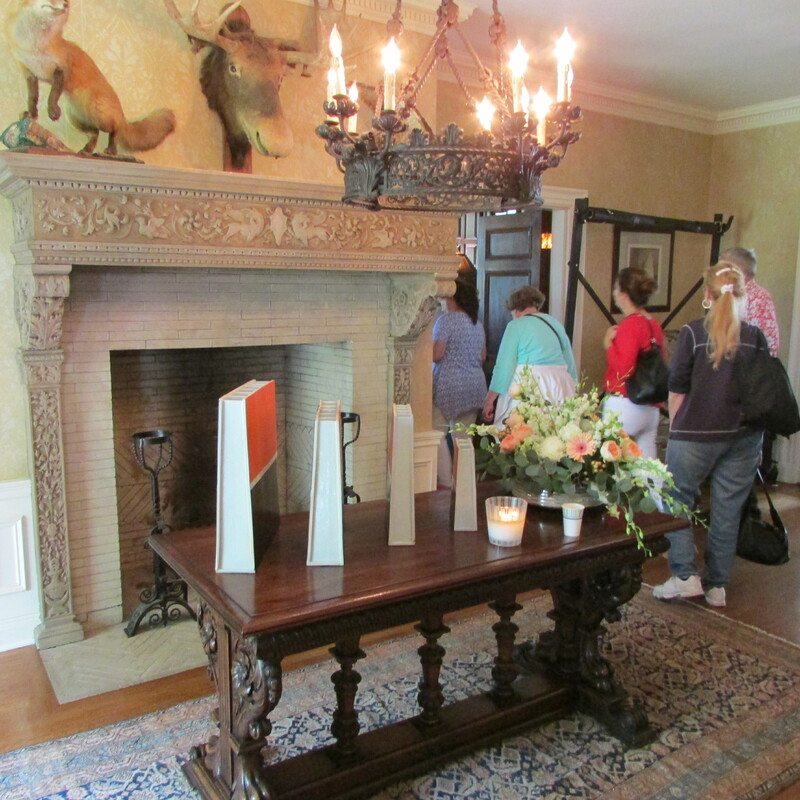 Your narrative was essential for enjoying these rooms, especially regarding use of color. Thanks again for all things beautiful. Hi there Suzanne, over there in Japan. The “real Housewives” is a reality show franchise, that follows the somewhat to dramatic lives of some really interesting people. I look at reality shows as modern versions of Soap Operas. There are Housewives in NYC, Beverly Hills, California, Atlanta, Georgia, Orange County California, and even a few more that I can’t remember now. I follow a few, but I like “Southern Charm” which is about the lives of both ladies and men who love in Charleston, South Carolina. Years ago I went to Charleston, and sometimes I see things on that show that I walked by. Thanks for your comment, glad you liked my post. Those purple couches 😍 And the goddess painting! I could look at that for hours! Hi there ErinMclarkCollins, I love it when people show their own taste, versus the “pedestrian” style of the moment. Dorinda’s place to me is all about seeing and discovering different things every time a person enters the rooms. Glad you liked my post. Hi there Amy, when I was at Dorinda’s house, I told her I was going to do the article about her place, and gave her my card. I told her I’ve so far, had over 2.5 million page views-articles read, since starting this blog, and she was kind of impressed. My friend Marguerite saw Dorinda at the Saratoga Race Track, and asked if she had seen my post about her place, she said she was traveling, but still had my card with my web address, and home address. Anyway time went by, and I never got a comment from Dorinda herself, or “Team Dorinda” on my website, or a quick note to my house, so I don’t know if she ever saw my post, liked my post, or ever as you said “Made Dorinda Proud”. So in the end, my post was a way for readers like you, who clicked on the article, to be able to take a little look into Dorinda’s world in the Berkshires. Amy I love your little town, and I probably have been in your beautiful store at the top of Main Street before. Soon I will be going to your town again, with my friend Marguerite, and then off to Millbrook to go through the stores. I will stop in and say Hi. 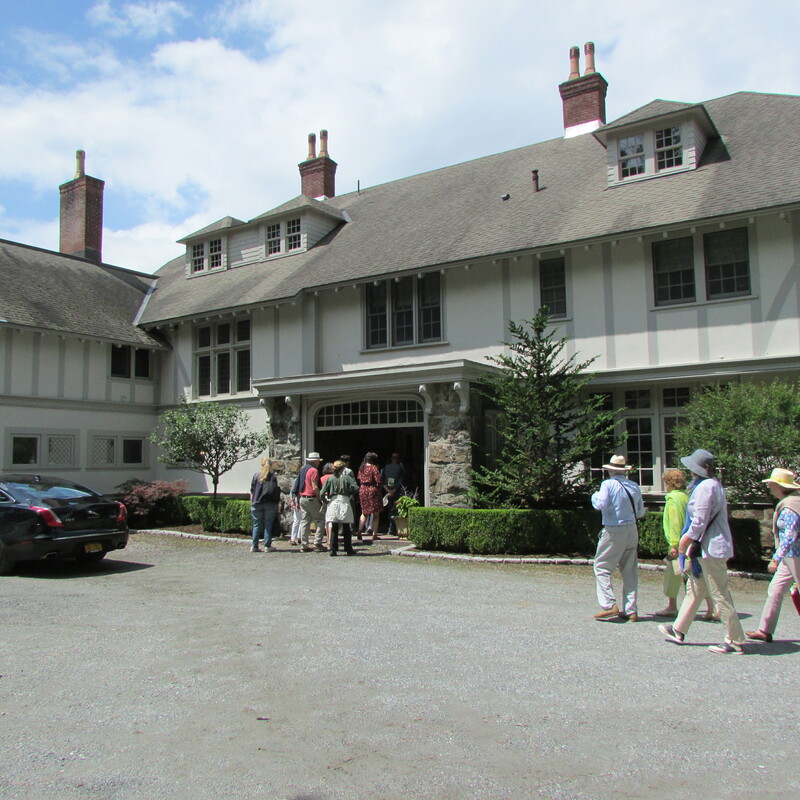 My next post, which I will be putting up, hopefully tomorrow, is about Marguerite and my visit to New Preston, Ct and going through the wonderful stores. Do you know Bunny Williams, I did a post about her in the past and have you ever gone to Trade Secrets in Sharon, Ct.
Hi Fred! Thanks so much for this even if I am a year late! I watch the ‘housewives’ and always hear Dorinda reference her home in the Berkshires. As a Pittsfield resident (no condolences neccessary), I finally became curious enough to try and figure out where it was located. Next weeks episode features the HW’s back in the Berkshires for a murder mystery party at Dorinda’s. It was fun to have a peek in advance of the episode! Did you know that each set of ‘housewives’ hold a different item in the opening of the show? In Atlanta, for example, it’s a peach. The NY ladies hold a diamond hence the pool toy you found. Hi there Dee, I don’t know what road Dorinda lives on, as we were taken there by bus, but we started at Simon’s Rock college and drove by a small airport and were by a country club in that area (those clues should help you). Being a Pittsfieldite you can figure out where she lives. Good luck finding Blue Stone Manor, I will eventually tour those Great Barrington roads myself.